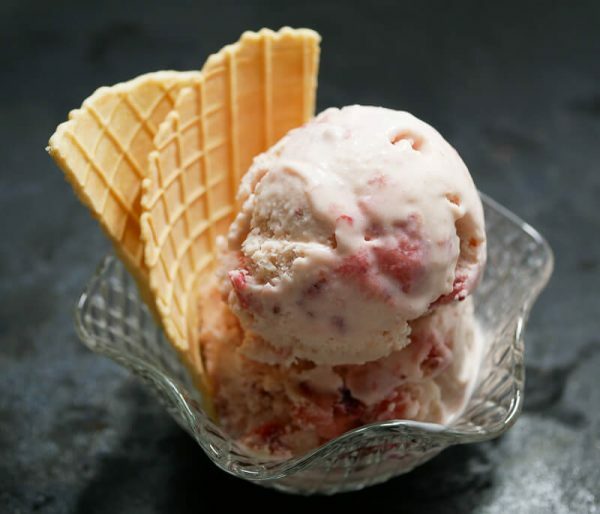 Strawberry Ice Cream with Vodka Infused Berries is an alcohol fueled twist on a classic ice cream. The strawberries used were at peak ripeness enabling me to cut back on the sugar. Serve the ice cream with with a waffle cone or a bit of whipped cream and it might just mysteriously vanish before your eyes. Already half-way through summer? Poo! The strawberries at the farmer’s market now are super ripe and very sweet! Have you picked any up for yourself? After eating strawberries all weekend long, I eventually had a craving for something creamy. Can you guess what idea popped into my head? 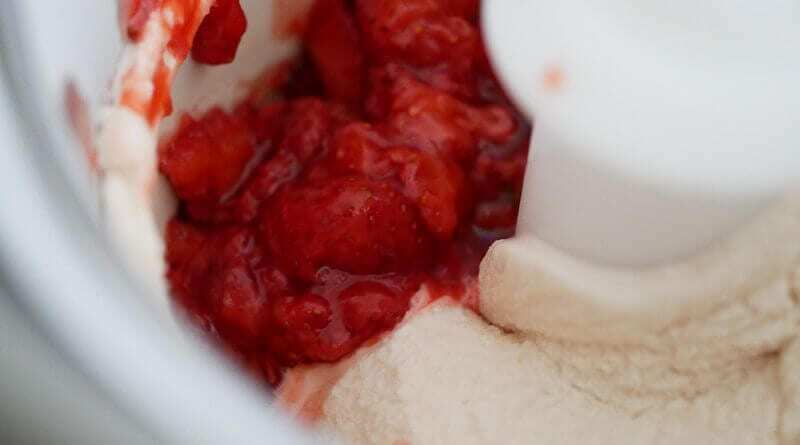 This is no ordinary strawberry ice cream. You know what makes this so special. The vodka helps to keep the berries from becoming completely frozen. Plus it makes the ice cream just a little boozy. Not overly so though. So don’t try to set it on fire! I suppose if you want it more boozy you could double the vodka. Or just have a few shots and chase it with this bomb ice cream. Totally up to you you party animal! If you are a super taster, though, you might be able to taste the vodka in the berries as is. 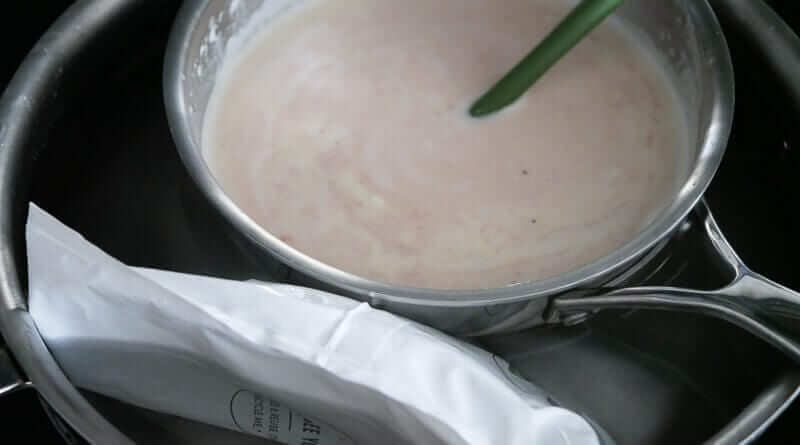 Following the recipe will result in a little over 3 pints of ice cream, that is creamy and not too rich. A solid dessert to round out your 4th of July holiday party or meal! 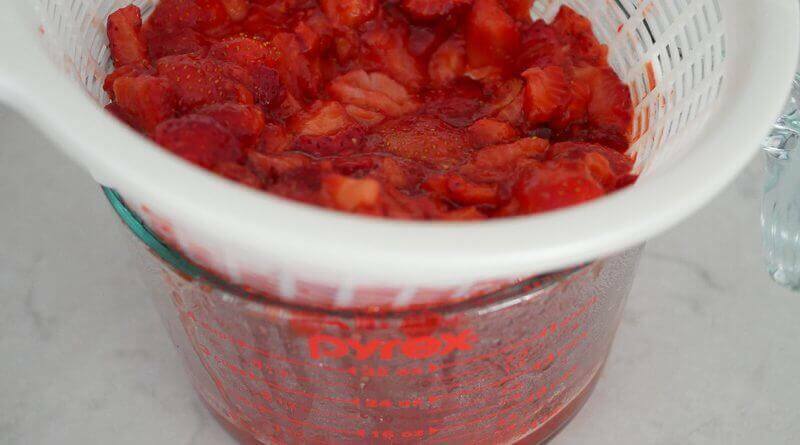 Combine the mashed strawberries, salt, and 1/4 cup sugar in a saucepan. Mix thoroughly and let sit for 30 minutes. Mix once or twice as it sits to ensure sugar is dissolved. Meanwhile, whisk egg yolks and 1/4 cup sugar in a medium bowl until combined and pale yellow. 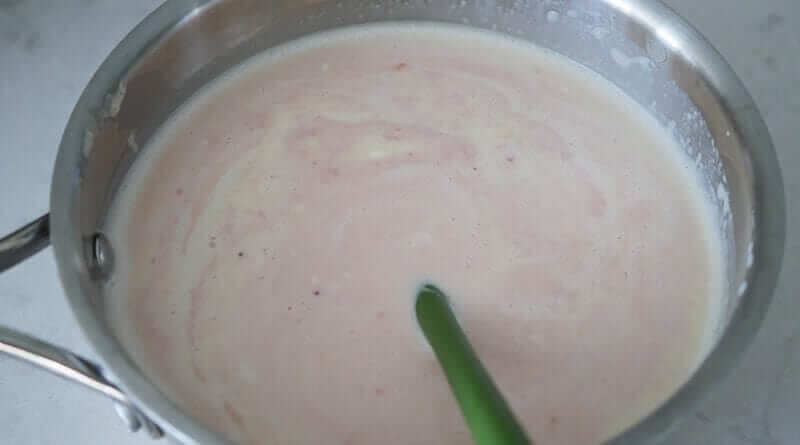 Once custard is ready, strain into the bowl set in the ice-water bath and stir occasionally until cool. Taking the saucepan with the strawberries, heat on medium and cook for 2-3 minutes and then strain the juice out. Put the strained berries into a bowl and add the lemon juice and vodka. Allow to cool. Take the strawberry juice and allow to cool in another ice bath or in the refrigerator. Once cooled combine with custard and also add in vanilla. When custard has cooled enough, start the machine and churn according to manufacturer directions. 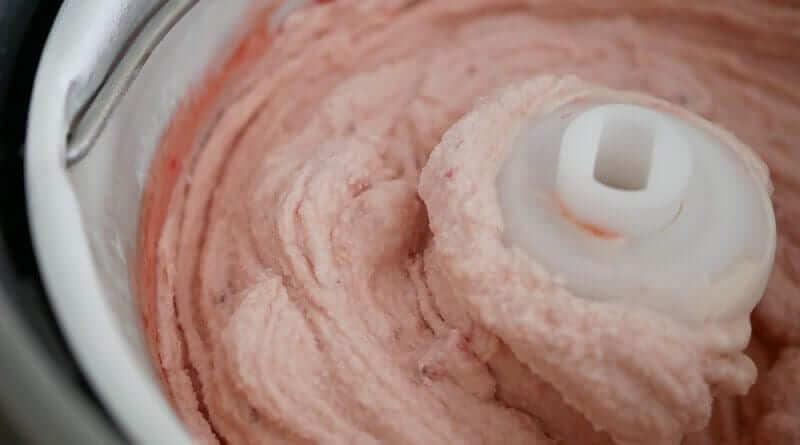 As the mixture begins to firm up, add the strawberries last and allow to churn or mix in with a soft spatula and freeze to firm up. Adjust sweetness to taste. If strawberries are very sweet you may be able to decrease the sugar. Remember you can't take out sugar, but you can always add more sugar after cooking the custard while it's still hot if needed! I love ice cream recipes that do not call for an ice cream machine. The strawberry flavour is one of my favourite, would definitely love a few of these. thanks for the note Daniela! This sounds so delicious Pat! I’m definitely making this at some point 🙂 Thanks for sharing! Thanks Rose! Lmk how it goes!!???? Sounds delicious! My mother used to make her own ice cream from scratch and I wish I could remember how she made it as it was wonderful. Sounds like a divine recipe. 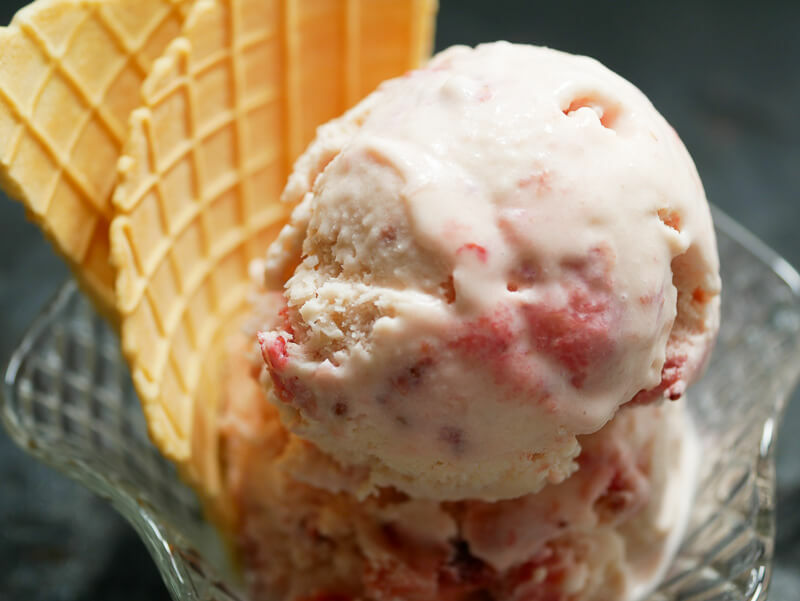 Boozy strawberries and creamy ice Cream. Yum! Strawberry Icecream and Vodka!?!?!?! I am so in. Haha hope you can get a buzz going from it! !